It's a pretty hot time in Las Vegas for music residencies. Reba and Brooks & Dunn have recently begun their show at The Colosseum at Caesars Palace. They talked about their residency in a CMT interview. Pitbull will be doing a mini run from September 23 to October 7 at the AXIS Theater at Planet Hollywood. Speaking of Planet Hollywood, Jennifer Lopez will be doing some shows at the AXIS Theater starting in January 2016. It looks like a fairly limited run though, with only a handful of dates each month in January, February, May, and June. I suppose more dates could be added later. Britney Spears also seems to be going strong at PH, with frequent show dates scheduled from now until December 31, 2015. I always get a kick out of athletes celebrating a big win in Las Vegas. A few years ago I wrote about Chris Paul celebrating his All Star Game MVP award in Vegas. This time it's the Golden State Warriors, who recently celebrated their NBA championship. An LA Times article told the story of Klay Thompson, Draymond Green, Andrew Bogut, David Lee, Marreese Speights, Harrison Barnes and Justin Holliday living it up at Marquee at The Cosmopolitan. The article goes on to tell how Barnes continued to party at Chateau Nightclub & Rooftop the next night at Paris Las Vegas. Arizona Coyotes Moving to Las Vegas? The Phoenix / Arizona Coyotes NHL hockey team is moving to Las Vegas according to a New York Post report. The deal is far from done though, as both the Coyotes and the NHL have denied the report. NHL commissioner Gary Bettman went as far as to say "The Post was told the story was completely untrue. They ran it anyway. The story is garbage. Team is staying put." Whether it will be the Coyotes, or perhaps an expansion team - it's becoming pretty clear that Las Vegas is getting a hockey team. Vegas has the lure of a brand new arena along with the support of 10,000 fans who've pledged to buy season tickets. MGM Resorts boss Jim Murren predicted Las Vegas will have a hockey team in time for the 2017 season, and that's looking more and more likely to come true. With the calendar now showing July 2015, let's take a look back and see how Las Vegas stocks did in the month of June. Penn National had a good month, up 10%. The Tropicana's new owners experienced strong regional gaming, especially at their new Massachusetts property. Boyd experienced a slight uptick as the Las Vegas locals market shows some signs of improvement. Las Vegas Sands was up slightly despite an uncertain Macau market, which sent Wynn Resorts down slightly. MGM Resorts International dropped almost 9%, in part because of the death of Kirk Kerkorian, and the news that his estate will be selling off their stake in the company. The big loser in June was Caesars Entertainment, down almost 35% on bankruptcy fears. Mandalay Bay has unveiled a collection of new rooms and suites. 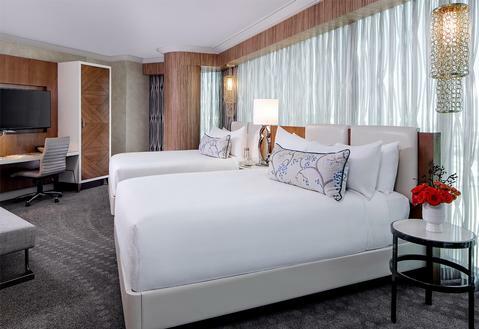 The resort tweeted a press release showing the new rooms. It looks like the entire hotel will be getting the new rooms eventually, with the first wave of rooms being available soon (the press release says July 2015 but I couldn't find any of the new rooms available until August 2015). The rooms have a bright, beach-like feel. I think they fit the theme of Mandalay Bay very well. It looks like the newly remodeled rooms will be $19 more expensive than the "old" rooms. Looking at a random weekday room in August, an "old" Deluxe King is $76 while a "new" Resort King is $95. An "old" Deluxe Queen is $85.50 while a "new" Resort Queen is $104.50. A random weekend in October shows an "old" Deluxe King at $280.25 while a "new" Resort King is $299.25. An "old" Deluxe Queen is $289.75 while a "new" Resort Queen is $308.75. These prices are before the current resort fee of $32.48. 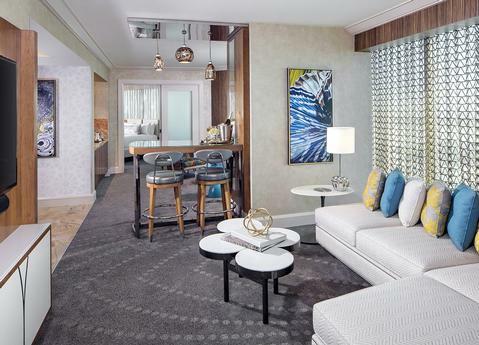 A recent filing with the SEC revealed that SLS Las Vegas isn't performing well financially. The first quarter 2015 results show low revenues with a large net loss. Ignoring the massive $35 million loss, the revenue numbers might be more troubling. SLS managed only $37.3 million of net revenue in the first quarter. In comparison the much beleaguered Circus Circus did over $51 million in net revenue during the same period. If those numbers weren't bad enough, noted in the filing was the news that parent company Stockbridge contributed $5.3 million to the company for working capital. Stockbridge will contribute up to $40 million until December 31, 2015 to help the company meet its financial obligations. With low revenues and the parent company needing to throw SLS a lifeline, things aren't looking too good. SLS might be able to turn things around, but they'll need to do something to attract people to the property. With their poor location that isn't going to be easy. With burgers and pizza taking over the Strip and Fremont Street, a buffalo wing joint might be a nice change of pace for your junk food craving. Enter Anchor Bar. The world famous Buffalo, NY establishment actually invented the buffalo wing. They have a few locations in and around Buffalo, but a new franchise has now opened in Las Vegas. Anchor Bar is located at The Venetian in the Grand Canal Shoppes. Despite having "bar" in the name, it's more of a fast casual spot with a few beers on tap. Along with the wings, Anchor Bar will also be serving up another Buffalo favorite: Beef on Weck sandwiches. "Thin sliced Roast Beef dipped in au jus and served on freshly baked Kimmelweck Roll." I can't wait to try one of those.